Need a light, fun, funny read? Everyone knows to turn to Dan Gutman. Even in a book that starts out with town-flattening tornado, a reader can expect to find appealing characters in realistic–but still entertaining–situations. The Talent Show takes place in Cape Bluff, Kansas, where an elementary school talent show intersects with a famous pop star and the second major tornado in less than a year. Will Julia ever dance on her own? Will Paul defy the authorities with his “risque” song? Will Don get over his stage fright? Will R.Akoon become the first white, 3rd-grade rapper? Will Elke . . . wait, where’s Elke? Spend a low-key hour or two with this quick read, and you’re sure to finish with a smile on your face. Talibah and Adom are with their father on a trip to Egypt. Talibah has always wanted to visit because of her Egyptian heritage, and is thrilled when they finally arrive. But soon strange things are happening and she must solve a centuries old mystery to help the past and future. 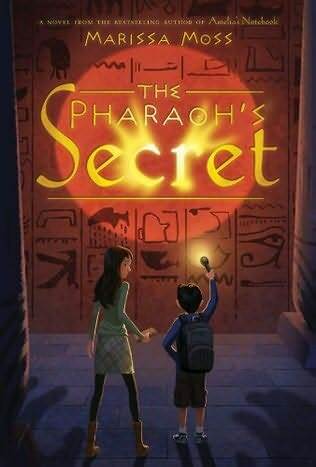 With cryptic messages and terrifying dreams, Talibah and her brother will journey through the land of the Pharaohs and work together to right an ancient wrong. When I was little, my brothers and sisters and I used to play school and restaurant (I always had to be the waitress) and store. We also put on “wonderful” shows for our mom and dad. What fun it was to pretend, and this little book reminds kids of all the fun they can have just by using their imagination. You can take your books and toys and … make a library! You can take an old pair of curtains and … make a theater! The illustrations in this book are very sweet and a little old fashioned, but kids today will still see themselves in the children in the pictures. Girls will especially love this book and will probably decide to go right home and make their own castle or hairdressers shop! Fancy Nancy’s friend gets glasses and OH! LA! LA! they are to be envied. They are lavender (fancy word for light purple) and glittery and they have a silver case and, best of all, a special pink & purple silk hankie to use for cleaning them. Nancy is so taken with the glasses that she begins to wonder if perhaps she too needs glasses! She tries to convince herself and her parents that her eyes see things all blurry and that when she squints things are better. Of course, Nancy does not need glasses, but she does come up with a “spectacular” (fancy word for great) idea! This book is about Melody who is almost eleven years old but she has never spoken a word, or walked or run or fed herself. She was born without the ability to control her muscles except for her thumbs. Her parents have always thought that she was bright but they have no idea how bright. Melody has a photographic memory, she loves words and she loves information. She can remember all of the infomercial numbers that she has ever heard. Her parents sent her to a regular school but most of her time is spent in the special education room. Melody longs to get a real education, and a real friend, and most of all would like to be able to talk. Sometimes she has something so important to say that she goes into a tornado fit trying to make herself understood. It is very frustrating for her. She finally gets a computer that allows her to talk and begins to attend regular classes and even tries to develop a friendship with a girl in her class. Then she tries out to be on the Quiz Team. This is a big deal because the team goes to Washington D.C. to compete on television. I really liked this book because it doesn’t sugar coat Melody’s life. It really deals with the issues of being trapped in a body that doesn’t work. It also deals with the issue of how others see Melody and relate to her. The book has wonderful, strong characters in it and though the story is not easy, it gave me a lot to think about. Sally Derby’s wonderful new book, Kyle’s Island, is very popular with our patrons, and we’re sure you’ll like it, too. We’re very happy to post this fascinating interview we recently conducted with her. If you don’t mind, I’m going to answer questions one and two together. I’d say I’ve always been a writer, ever since I learned how to write words and sentences. I remember in second grade skipping all the way home on the day my teacher told me that a little poem I’d written would be printed in the school paper. It went, “There’s a little tiny place I know, a little wooded hollow. It has a carpet of violets so fresh and so blue, and the morning grass is wet with dew.” Unfortunately, the principal didn’t believe I could have written it. She called me to her office and questioned me so sternly I ran home crying even though the school day wasn’t over. My mother, I remember, took me by the hand, marched me back to the school, and in my presence gave the principal a piece of her mind, which was even more distressing to me. It’s a wonder I didn’t give up writing then and there. But yes, I’ve always wanted to be a published writer. If I had been braver, I might have been published sooner, but every time I sent something out and got a rejection slip back I was so discouraged I didn’t try again for years. And in those days I never sent anything elsewhere. To me, a rejection slip said, “This is no good.” How foolish I was. I’ve always wanted to be a philanthropist, but I’ve never known how to make enough money to be one. So I just have fun choosing and giving presents (especially books) to people I love. Oh, my, that was a long time ago! I know I spent about four years sending the manuscript to various publishers until Four Winds Publishers bought it, and then it took me six months or so to cut and revise it the way the editor suggested. And then came the lonnnng three years of waiting for the artist to do the illustrations, so that makes about seven and a half years, right? The only way to live through that long a wait is by writing other stories in the meantime! It’s very hard for me to stop revising. Sometimes when I reread one of my published books, I’d like to begin revising it again. I guess my first ending point comes when I am so excited about sending the story to an editor that I can’t wait to print it out and put it in the mail. For me the hardest part is letting my characters behave badly sometimes, just as it’s hard for me to let bad things happen to them. In Kyle’s Island, when Kyle told Zach he couldn’t stay on the island that night, I wanted Kyle to see right away how mean that was, how he was hurting Zach, but I knew he couldn’t see that right away, that he’d have to realize it later and be ashamed of himself. Still, I kept trying to write it the other way until I realized that it just wouldn’t work, that Kyle had to learn the hard way. I’d love to write a book about the year I spent living in a small cottage with a thatched roof and a tidy garden in the south of England. But first I have to get a small cottage in England and then I have to learn how to tell flowers from weeds. And I think my passport has expired too. What made you decide to write books for children, rather than adults or teens? How many adults do you know who ever love a book enough to read it five or six times? Children will do that. I want to write a book that a boy or girl will love that much, a book like Sylvia Waugh’s The Mennyms and its sequels. Practical advice: After you have written something, read it out loud before you show it to anyone else. Did you really write what you think you wrote? Best advice: Keep learning, keep reading, keep writing, never give up. Persist, persist, persist. Ideas come from everywhere, I think. Everything I’ve seen or heard, every person I’ve known, every scrap of conversation, funny newspaper article—when I write those things will find their way into my writing when I need them—changed, exaggerated, expanded—the same, and yet completely different. For the most part I won’t have the faintest idea whence or how a detail has arrived; I’m just grateful it happens. Did your family have a cabin on a lake when you were growing up or when you were raising your children? The cottage in Kyle’s Island is the cottage my grandparents owned when I was growing up. My mother inherited it when Grandma died, and a few years later Mom and Dad sold it But it was in the family long enough for my older boys to remember staying in it. I understand it was torn down some years ago. But I can still go there in memory and see it clearly in every detail just as I describe it in the book. How long did it take you to write Kyle’s Island? It’s almost impossible to say how long it took to write a book. When did I begin? When I began writing it in my head? When I opened a notebook and wrote the first sentence? And when did I finish? After the first draft? Or the tenth? Do I count only the time I spent writing, or do I include weeks when I was too busy to work on it but it was in my thoughts as I went on with the rest of my life? My best guess is that it took about two years off and on. I’d have to pick E.B. White. Besides Charlotte’s Web, Stuart Little, and Trumpet of the Swan, which are primarily for children, he wrote beautiful, funny, and sad essays for adults too. Probably Cicero, who wrote in Latin a long time ago. In college I translated so many of his essays that I knew how to put together sentences with several clauses that were assembled logically and clearly. Obviously not a good role-model for someone who is trying to write picture books. Poets make better models for picture-book writers. Your picture books have very different illustrative styles. Do you get to have any input when it comes to choosing an illustrator or making any suggestions about the pictures? I have never had much input on the selection of editors, and I have seldom seen the art in its early stages. Fortunately, I have had editors who have made excellent selections for me. I love the artwork in all of my books except one, and I’ll never tell you which book that is. Do you have a favorite illustrator? How do you find time to write having raised 6 children and 6 foster children? Let’s see—reading, watching the birds at the feeder outside my window, reading, working crossword puzzles, walking in the park, reading, swimming, playing bridge, reading….did you notice that cooking is not on the list? I used to cook. I cooked a lot. I cooked for a long time. These days my husband cooks. Thank you for your questions, and thank you for giving me this opportunity to think about what I have been and am still doing. It’s a privilege to be able to write for children, and I am so grateful to able to do it. Happy reading! Thank YOU to Sally Derby–what fabulous answers! If you’d like to know more about Ms. Derby or her books, check out her website sallyderby.com. The book’s cartoon-like illustrations capture the liveliness of the Twain household. Some look to be taken from photos of Twain himself. A nice touch is the inclusion Susy’s “journal entries” on most of the double page spreads. The Extraordinary Mark Twain is a loving tribute to Susy’s father but also to fathers everywhere who’s winning ways capture the hearts and minds of the ”little girls” from 6 to 60 who adore them warts and all.